At our house, McGavock Manor, we have over 50 houseplants, and a zillion more outside. People always ask us how we manage to take care of that many plants. So today I'm going to give you insight on how to keep your indoor plants alive and thriving. 1. The most important tip for keeping your plants alive is to buy the right plants. Look at my guide here on what plants are truly low maintenance plants. If you are new to keeping houseplants alive, buying low maintenance plants is crucial. You may have always dreamed of owning a fiddle leaf fig or fern, but don't even think about it. Build your way up to those finicky plants. 2. Directly related to the tip above, be aware of the lighting that your house has. Pay attention to the rooms that get a lot of light and the ones that don't. Don't buy a plant that prefers low light conditions and stick in the window. I generally don't like plants that want medium light. In my opinion, those seem to be more high maintenance. In my house there is either a lot of light or no light. What the heck is medium light? That is too fussy to me. 3. Get on a schedule or don't. But if you don't, make sure you pay attention. A lot of people like to water on certain days. This way they don't forget to water their plants. I used to do that but I could never stick to a schedule. Now, I pay attention to the soil and what the plants look like. 4. Put your plants in places where you will see them regularly. This may seem weird or obvious, but don't put plants in your guest room that you never use. You'll forget about it and it will die. We used to have several plants upstairs in our Airbnb but most of them died because I didn't see them daily so I forgot about them. 5. Fertilize your plants. Listen, I don't do this and my plants have been fine, but I need to. I think this is why some of my older plants are alive but not thriving. You fertilize in the Spring and Summer and not when they are going into hibernation. 6. Rotate your plants. You can do this every time you water them. Turn them a little one way and keep rotating them more in the same direction every time you water. The idea is to expose the entire plant to light more evenly. If you've ever noticed one of your plants dying on one side and looking amazing on the other, this will help with that problem! 7. Use pots with drain holes. Proper drainage is crucial for your plants health. Most plants don't like soggy roots. Also, don't forget to buy the saucer that fits under your pot to catch the water that drains. I forget this tip all the time and then I'm crying every time I have to mop up all that water that pours out. Okay, maybe not real crying. But recently I bought saucers for every plant in the house and now watering is relatively drama free. This is certainly not an exhaustive list and there are people who know a lot more about plants than I do that have a lot more to say. 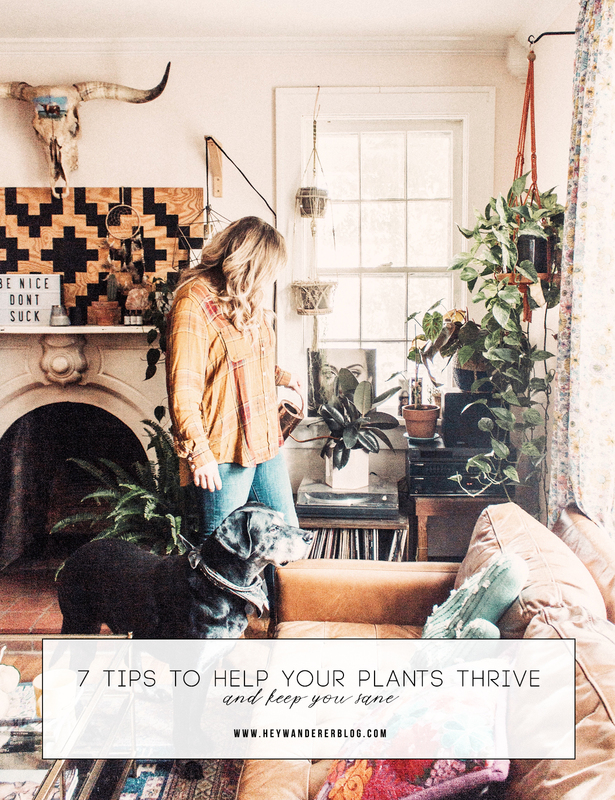 These are just the tips that have helped me take care of our ever growing plant collection. Do you have any plant tips or tricks? Let us know in the comments. We are certainly never above learning! If you love this post, please pin this image!